Firstly, I’d just like to say thank you to Judrina Kymantas and High Octane Pictures for sending me a screener of the Horror/Thriller film “Clowntergeist”, Written and Directed by Aaron Mirtes. Clowntergeist centers around Emma (played by Brittany Belland from The Sleeper), a college student with a major fear of clowns. 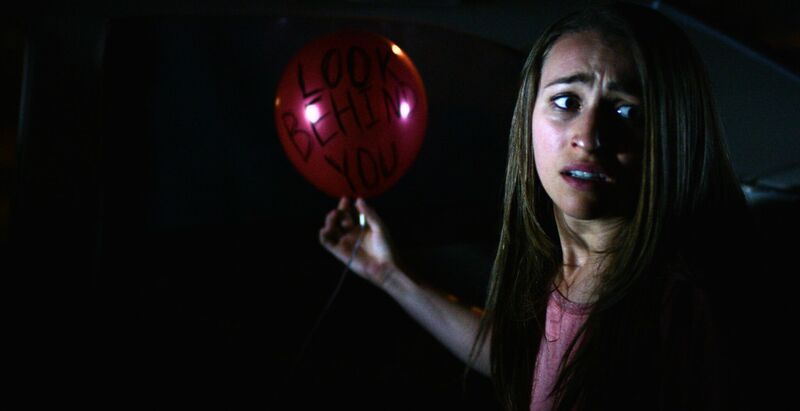 It’s a fear that’s put to the ultimate test when an evil spirit latches onto a clown and begins terrorizing her home town, leaving red balloons with sinister messages on them everywhere he goes. The film also stars Monica Baker, Burt Culver, Sean Patrick Murray, Tom Seidman and Eric Corbin as “Ribcage The Clown”. I’ve long been a fan of the clown sub-genre, so much so that I even acted as an associate producer on Damien Leone’s upcoming clown film, “Terrifier”. There’s something about them that doesn’t quite sit right with people. The creepy face paint, oversized shoes, and of course that uncanny ability to turn a balloon into just about any member of the animal family. Judrina recently hooked me up with the martial arts film, “Karate Kill” from Petri Entertainment *see review* https://adamthemoviegod.com/karate-kill-review-2/. It was a lot of fun and a total throwback to the old school Asian martial arts films of the 80’s and 90’s. This time I thought I’d try my luck with an evil clown film. There’s been a real resurgence in the sub-genre lately. We’ve had everything, from the low-budget “Killjoy” franchise and Rob Zombie’s extremely disappointing “31”, which promised unrelenting mayhem and failed to even deliver on the most basic technical film making level, all the way through to the highly anticipated remake of Stephen King’s infamous, “IT”. 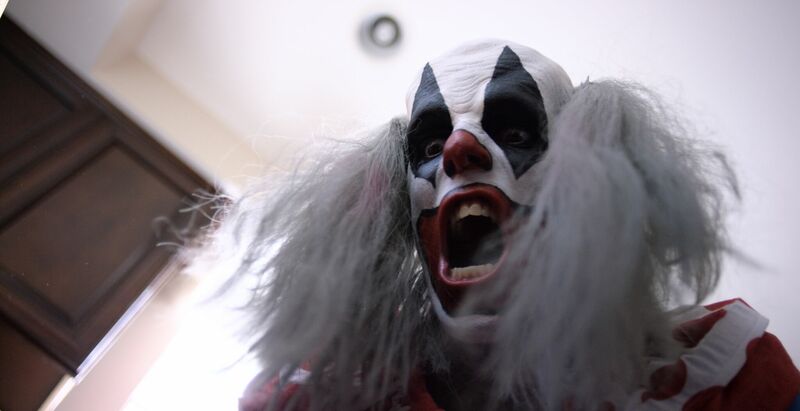 Clowntergeist is clearly Mirtes weighing in with a low-budget entry, but he’s tried his best to fuse genuine paranormal built suspense with a basic fear one might have of clowns as performers. I’m digging the artwork despite the fact that the clown image doesn’t correspond with the look of our villain. It’s a simple but threatening figure at the forefront and an old style font used for the title, though I’m not sure why it is that indie films use misleading imagery (to be fair I think it’s the distributors who are at fault). Taking into account the film’s low-budget, Chaz Olivier’s cinematography is generally quite good and the audio track is clean. Most of his framing is neat and there’s a great jib shot (crane) across a driveway and onto the street as Ken’s daughter (played by Caitlin Rigney) drives away at the beginning of the film. I liked a lot of the establishing shots as well, particularly the externals of both Ken’s house and Emma/Heather’s. That said, almost the entire film feels like it’s been done handheld, via a Steadicam, and consequently it doesn’t feel as cinematic as it could have. The lighting was another characteristic that was really well conceived. Most notably during a sequence that sees Emma’s work colleague and friend, Jonah (Murray) navigating a hallway and its surrounding rooms. The scene is back-lit with reds, greens and blues and it looks gorgeous. Kris Bendrick composed a simple but effective bass orientated score, adding a nice mix of strident synth notes, to boot. Even some of the sound design worked well, like the scratching of balloons and carnival clatter. 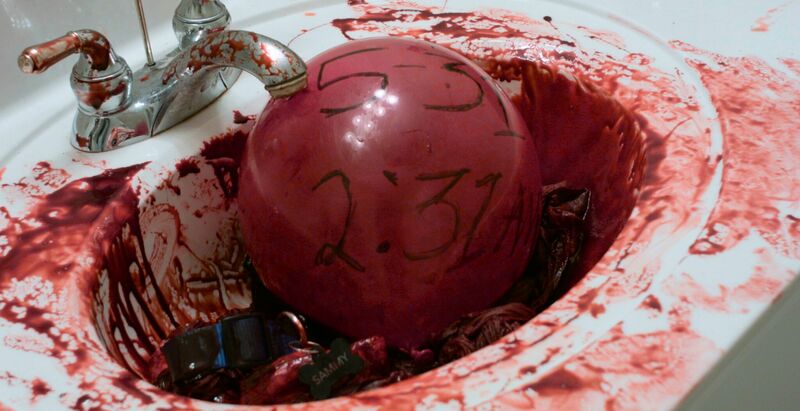 The opening scene of the film makes for a great introduction to “Ribcage” the clown and was reminiscent of a segment setup in the 08′ horror anthology, “Amusement”. Aaron deserves credit for his ability to generate this amount of tension, especially in an independent film where often that falls by the wayside. Here, its striking but subtle jump scares, usually coming in the form of a hand or a face popping into frame momentarily, it’s genuinely scary. There’s Jonah’s scene I mentioned earlier, the pinnacle of which resulted in me just about jumping off my chair. Other scenes include a girl navigating a house trying to get the power back on, a scene that’s simply lit by a lantern and you’re just waiting for that inevitable evil surge. Most of the performances are serviceable but there’s no doubt that the natural chemistry between friends Emma and Heather (and in turn actresses Belland and Baker) is what ultimately holds the film up. The dialogue flows organically between the two and therefore it seems as if they have a real friendship outside the parameters of a film. Aside from the odd weaker moment early on by Culver, as Ken, the remaining cast (mostly made up of men) are solid, particularly Pop (Seidman), the ice cream man, though none are really at the core of the story. There are a few scenes that showcase some practical blood and gore and it does look decent but Clowntergeist is much more about its demonic roots (encase the title didn’t inform you of that). The makeup job on Eric Corbin is worth mentioning because it looks great and the continuity of it can’t be questioned. What happens at 2:31 am? I’m going to kick this off with the title. Normally I’m all about the cheesy amalgamations, and let’s be honest, it’s almost a given these days with the amount of creature features being churned out at such a rapid rate. Clowntergeist just sounds lame though, and while it might be accurate given the plot synopsis, it comes off as pretty lazy. Ignoring a few abrupt cuts and the fairly basic approach to the films presentation (perhaps due to budgetary restraints) there’s not much to criticize on the technical front. There is, however, a lot of contradiction when it comes to the script, so much so that Mirtes, in part, undoes a lot of his good work. Some of the dialogue only serves to relay developments that are self-explanatory to the viewer. Lines like, “Is that the sheriff?” said by a character whose only standing a few meters away from a guy clearly wearing an officer’s uniform, badge in plain sight. Shortly after that you get, “Murders a freaky thing”, which is obviously not something anybody would say. Most of my issues with the film are surrounding personal preferences regarding Aaron’s script. Immediately I noticed that actress Caitlin Rigney appeared too old to be playing Ken’s daughter, I thought she was his wife. The demonic aspect of the film and commands and controlling of Ribcage didn’t feel like it was warranted. Mirtes does all the right things in building suspense through simplicity and minimal techniques, yet once we finally see and hear Ribcage in all of his glory (or as is the case is here, lack of) the better part of his efforts are instantly null and void because the clown is just not scary. Corbin moans and growls while crouching around, and motions in what can only be described as a dance. In hindsight, once all the strings are pulled and the film comes full circle I don’t think the blame could be solely placed on Eric. Add to that, a really weak motive behind this targeting and little to no back story given on the clown/demon’s origin, not to mention, not once does anyone try to kill the clown (well other than Ken’s half-baked effort), it sort of all falls into a screaming heap. As I said earlier, there were glimpses of blood and gore but most of it goes unseen due to the quick cuts in the edit. Aaron Mirtes’s, Clowntergeist was an interesting take on the clown sub-genre but ultimately I just don’t think it works in this particular setting. Most of the cinematography is pretty good and the audio track is a lot better than most independent films. Both the lighting and score were probably my two favourite aspects of the film and they definitely aid in raising the overall production value. The performances are pretty solid, the characters entertaining and I enjoyed watching Brittany in another lead role. There’s four or five really impressive fear inducing scenes in the first two-thirds of the film that are far superior to anything I’ve seen in independent cinema. There are a few scenes with practical blood and gore and the makeup looks professional. I’ll be honest and say I’m not a fan of the title at all and there are a handful of lines of dialogue that were redundant. One casting decision was somewhat questionable and the specifics of the character manipulation seemed unnecessary. The biggest disappointments are the paper-thin motive behind the attacks and a general lack of exposition on the clown himself. I could swallow all that to some degree if Ribcage was even remotely scary, but alas. The film works better during its lurking stages because Corbin’s performance and the theatrics of the character lost me and the film didn’t have enough memorable kills to keep me engaged. Still, if you’re a fan of clowns and paranormal horror you might get a little more out of Clowntergeist than I did. Mirtes does manage to do a lot right and I look forward to seeing what else he does in the genre. 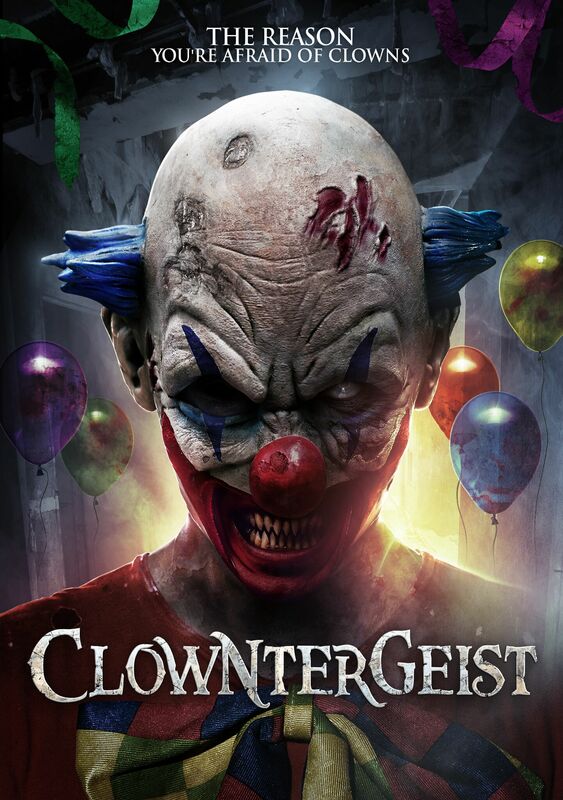 Clowntergeist hits VOD (video on demand) September 12th and you can check out the trailer below!